The radio-sized SE5000 incorporates 2 smartcard slots, LCD display and thermal printer. With its internal data storage facility, the SE5000 has the ability to download or print up to 1 year's tachograph activity. 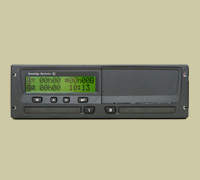 This tachograph also records data onto drivers cards, which hold approx. 28 days activity before getting over-written. The SE5000 is simple to operate and includes many features designed to make the driver's job easier, including Drivers Break Warning, Daily Activity Prints, automatic recording of activities for driver & vehicle. 12v & 24V variants (Light & Heavy vehicles). Robust card reader (no motors to breakdown). Manual card eject facility (If card gets stuck inside VU). Easy paper roll loading system. Additional data recording functions as standard. Activity change facility, independent of menu in display.